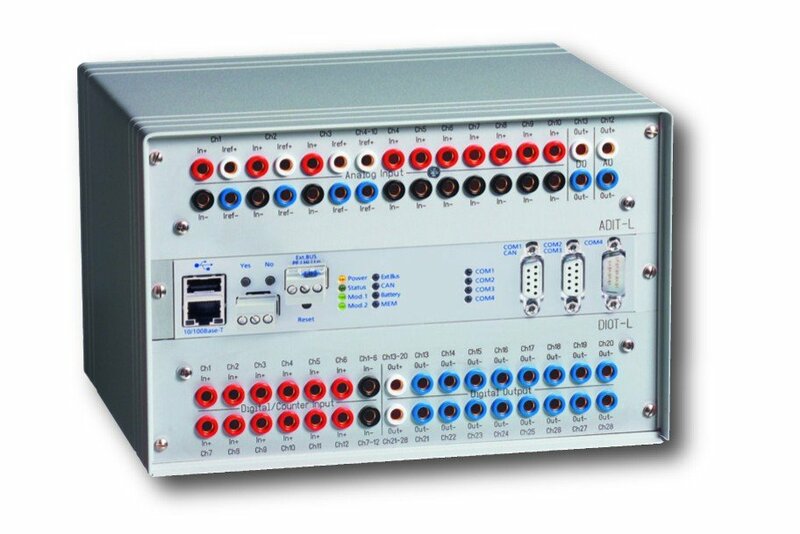 ProfiMessage is the modular system for data acquisition, monitoring and automation of machinery, plant and test stands. ProfiMessage uses master and slave devices and a range of I/O modules to enable it to be adapted to any application. 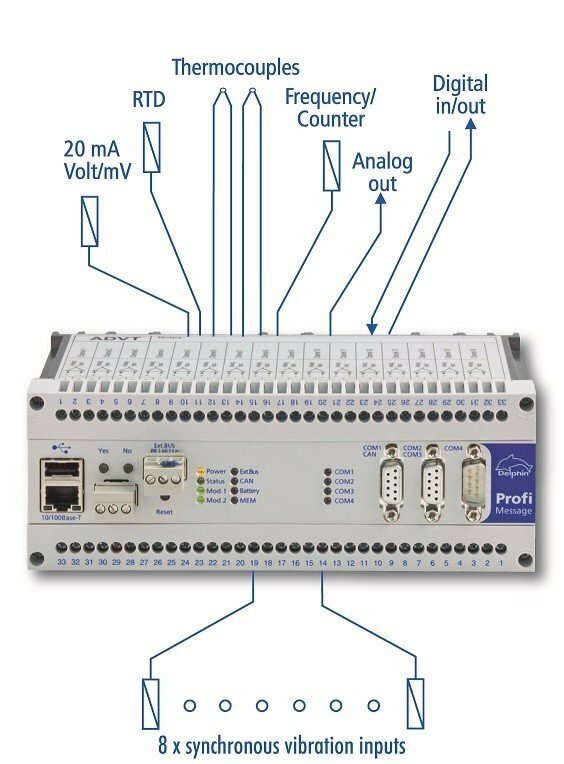 ProfiMessage is for applications requiring high-speed, precision data acquisition with galvanic isolation, intelligent data pre-processing and monitoring functions. Areas of application range from the monitoring of industrial processes, plant and clean rooms through to data acquisition and test stand automation. ProfiMessage devices have universal connectivity. The devices are equipped with flexible I/O modules and a range of field bus interfaces. Connecting to PLC control systems for data exchange is easy and problem-free. Measurement data is stored with extremely high time resolution making it particularly suited to systems for fault data acquisition and diagnostics. The compact devices measure and store data as stand- alone, independent systems. An internal 16 GB memory is able to record. The data can also be accessed online via an Ethernet inter- face, either manually or automatically according to predefined time plans. At the press of a button on the USB port, the data can be transmitted to a USB memory stick and evaluated offline. In conjunction with vibration measurement I/O modules, the ProfiMessage becomes a shaft and bearing vibration measurement device. Devices are then typically deployed in monitoring and analysis systems for condition monitoring. By attaching modems or router, users can use ProfiMessages as independent remote monitoring systems for plant, marine vessels, vehicles or similar decentralized machinery. ProfiMessage devices are equipped with further functions in the form of software channels. Software channels enable functions such as threshold value monitoring, mathematical integration or online computations. They are extremely easy to configure. Users are then able to program their own monitoring or online analysis systems into the device with- out requiring any IT expertise. Delphin products stand out with this functionality. Users are then able to quickly and effectively deploy their ProfiMessage devices for their day to day requirements. Depending on the type of I/O module being used, each input can be configured separately to measure mV, mA, RTDs and thermocouples. Universal inputs enable the measurement of voltages, currents or temperatures making ProfiMessage extremely flexible to deploy. ProfiMessage is also equipped with digital inputs, for functioning as status or frequency inputs, as well as digital / analog outputs. 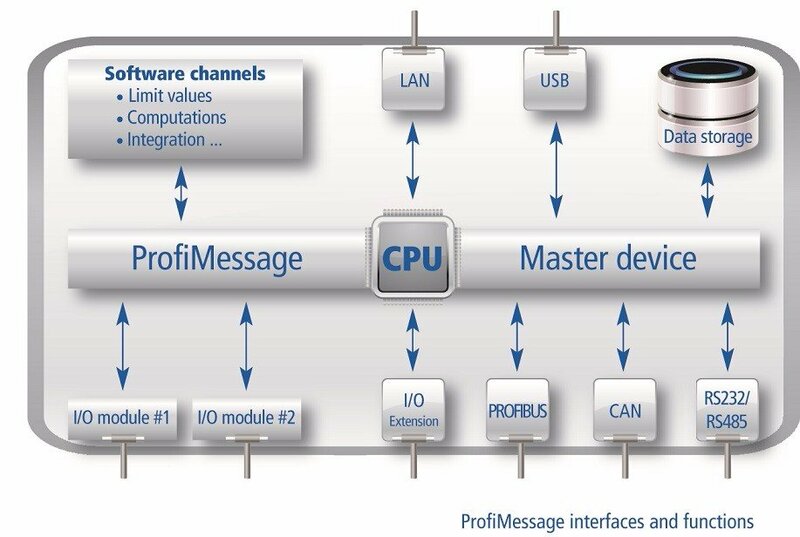 A major benefit of the ProfiMessage device is the differential, high-precision and galvanic isolation of its inputs and outputs – isolation from channel to channel and from the power supply. Earth loops and non-isolated sensors therefore present no problems. This unique system architecture enables problem free non-isolated measurement. Configuration of ProfiMessage devices takes place using Configurator software that is included in delivery. The soft- ware gives a clear overview of channels, with operation being intuitive and similar to the Windows Explorer functioning. Double-clicking a channel opens a configuration dialog portraying all the channel's properties. The individual configuration files are stored in XML format within the ProfiMessage devices and can therefore be accessed and updated offline using an XML editor. ProfiMessage master/slave devices can be equipped with two modules (see table below). Up to 20 slaves, with identical housings, can be connected to a master device. Data exchange between devices takes place via a real-time expansion bus using robust two-wire technology. Slave devices can be decentrally installed and administered from a master device. Nine different I/O modules are available for ProfiMessage. A master or slave may contain either two identical or two different I/O modules. Master devices are also available without internal I/O modules for the exclusive processing of field bus signals – such devices can then function as PLC data loggers or deployed for process fault detection and diagnostic systems. 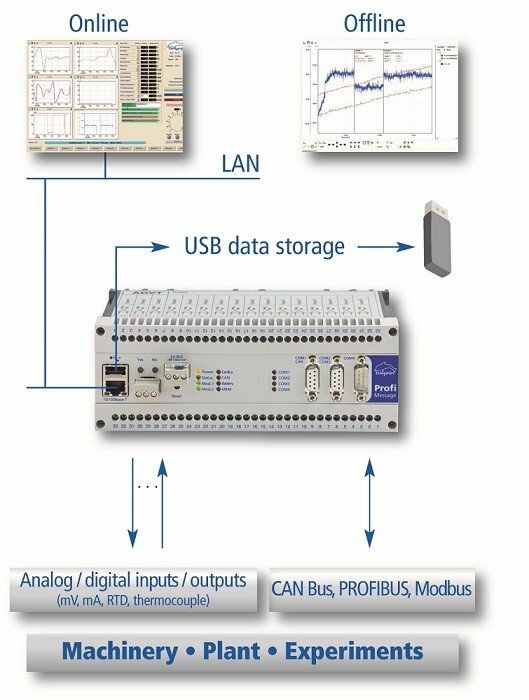 ProfiMessage offers a range of field bus interfaces. 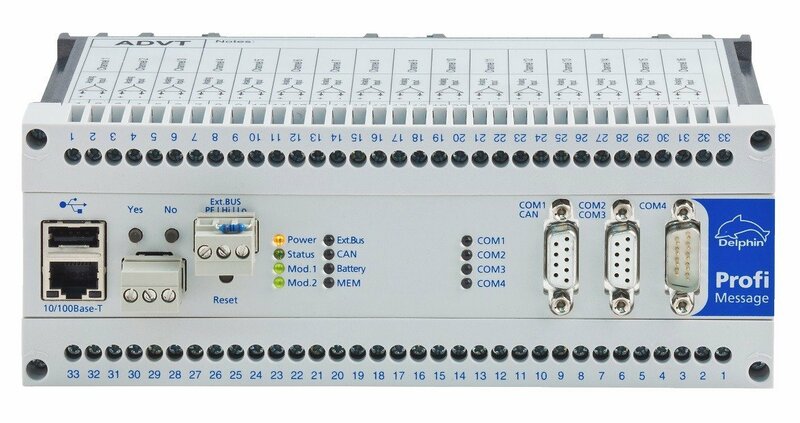 A master device has two PROFIBUS DP slave interfaces (redundant according to PNO 2.212 V1.2), one Modbus TCP, one Modbus RTU, and one freely configurable CAN interface. The interfaces can also be used to connect any serial measurement devices and sensors via RS 232/485. An Ethernet high speed connection is for connecting ProfiMessage to a PC workstation or server. ProfiMessage is equipped with two separate PROFIBUS DP slave interfaces. ProfiMessage integrates into PROFIBUS using GSD files. 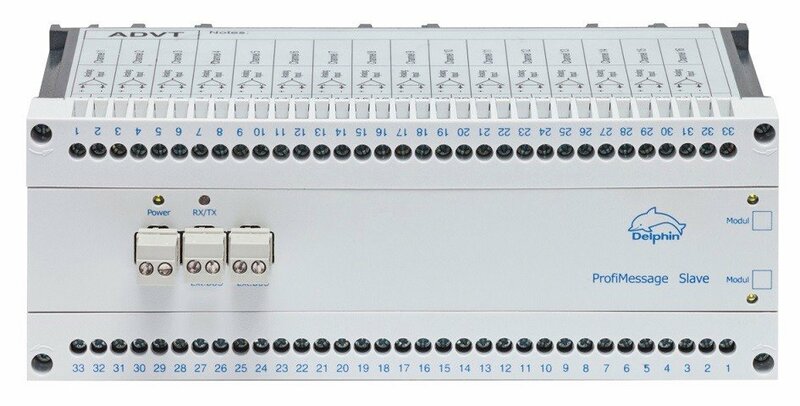 Virtually any analog or digital signal can be read or written from PROFIBUS. An option is available to switch the type of operation to redundant PNO 2.212 V1.2 PROFIBUS. The LAN and RS485 interfaces can also transmit data via the Modbus TCP / RTU protocol. ProfiMessage supports both Modbus master or slave operation. The serial interfaces are able to function under different protocols. The protocols can be generated either by the user or by Delphin. ProfiMessage serial inter- faces are being used in climate chamber operation, for laboratory equipment, for power measuring hardware and GPS receivers. The CAN bus interface can be programmed as required. Any identifier from a CAN bus can be read, scaled, pro- cessed and stored. The LAN interface can be used to transmit all measurement data online, including software channels, at high speed via intranet or internet. Any networked PC can then access the ProfiMessage devices via this interface. There are also additional TCP services such as NTP, FTP, HTTP and SMTP etc. available. The device's internal data memory can also be read out via LAN. The USB interface can be used to transmit data from the internal memory to USB memory stick. The expansion bus enables up to 20 slave devices to connected to the master device. ProfiSignal is a complete software system for data acquisition, analysis, visualisation and automation. The software is very user-friendly and combines professional functionality with easy operation. ProfiSignal provides a clear and logical overview of all measurement systems: whether for single or multi-thousand channel applications. For new users, ProfiSignal is quick to learn. ProfiSignal is modular, scalable and available in three versions: Go, Basic and Klicks. Each version has backward compatibility for operability, data files and application projects. Measurment hardware configuration takes place with the DataService / Configurator software included in ProfiSignal. The software configures hardware and software interfaces and records data securely and permanently. The DataService saves measurement data to a database. Any ProfiSignal version on the network can then access these databases and immediately display their data as trends. ProfiSignal GO is a runtime system enabling measurment data to be displayed and analyzed in just three steps. The GO version is able to analyze large volumes of offline and online data. ProfiSignal is a complete software system for data acquisition, analysis, visualisation and automation.